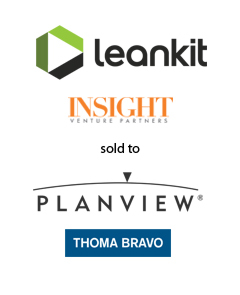 AGC is pleased to announce that its client, LeanKit, a portfolio company of Insight Venture Partners and the leading enterprise Kanban tool, helping organizations visualize work, optimize processes, and deliver value faster, today announced that it has been acquired by Planview, a portfolio company of Thoma Bravo. The acquisition of LeanKit provides Planview with a firm foothold in Lean and Agile. LeanKit’s “Enterprise Kanban for Engineers” solution advances Planview’s work and resource management (WRM) vision of supporting all the ways organizations work, ensuring they can plan and scale more effectively to deliver customer value faster. With a team led by Ben Howe, AGC Partners acted as sole financial advisor to LeanKit.